RUBICK (AUS) (Bay 2011-Stud 2015). 3 wins-2 at 2-at 1000m, 1100m, A$379,500, MRC Schillaci S., Gr.2, Blue Diamond Prelude (c&g), Gr.3, ATC TAB Iphone App 2YO P., 3d ATC Challenge S., Gr.2, 4th MRC Blue Diamond S., Gr.1. Out of SW Sliding Cube (AJC San Domenico S., Gr.3), a three-quarter sister to SW Redoute’s Choice and SW Platinum Scissors, a half-sister to SW Manhattan Rain and SW Echoes of Heaven. Sire of SP Biscara, Krameric and of the placegetters Chia, etc. His oldest progeny are 2YOs. CONTEMPT, by Commands. Unraced. Half-sister to Niccolance. Dam of one named foal. Niccolance (Nicconi). 2 wins at 1100m, 1400m, A$262,560, ATC Royal Randwick Fashions H., Independent Education P., 2d Wyong Magic Millions 2YO Classic, RL, ATC Surf Meets Turf 2YO P., 3d ATC Hong Kong Tour H., 4th GCTC Magic Millions 2YO Classic, RL. ATARAXIA (Teofilo). 2 wins at 1350m, 1600m, A$133,605, in 2017-18, ATC Dulcify H., L, 3d ATC Pride of Dubai at Coolmore 2YO H.
Malaise (Helmet). 4 wins at 1300m, 1400m, A$345,155, to 2017-18, MRC Ladbrokes Cash Out H., ATC Turf Club H., Schweppes H., VRC Young Members' H., 2d VRC CS Hayes S., Gr.3, MVRC Harrolds H., ATC Derucci H., Turf Club H., MVRC William Hill H., MRC Keno Superplay H., Ladbrokes the Challenge H., 3d MVRC Catanach's Jewellers H., Ladbrokes Cash in H., ATC Tab.com.au 2YO H.
Careless (Exceed and Excel). 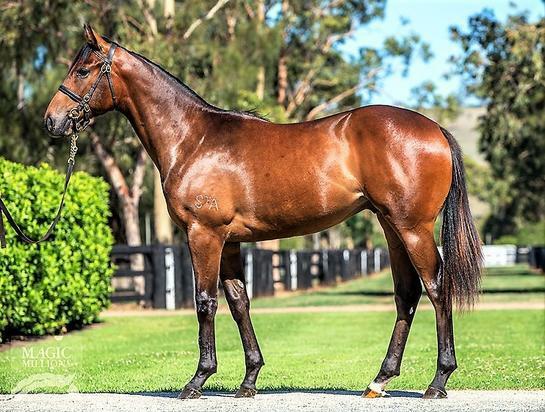 3 wins at 1300m, 1400m, A$314,060, ATC Grand Pavilion H., Schweppes H., Scone RC Newgate Stallions P., 2d ATC Fernhill H., L, Cellarbrations Alexandria 2YO P., Supporting Surf Lifesaving H., Foodbank H., Mossman at Vinery P., TAB Rewards H., 3d MRC Gothic S., L, ATC Cellarbrations H., Weathertex H., Theraces H.
SASH (Dr Grace). 5 wins to 1400m, A$152,068, AJC Toy Show H., L, Tom Street Quality H., 2d AJC Sapphire S., L, 3d STC Millie Fox S., L.
THE OSCARS (Procol Harum). 4 wins-1 at 2-at 1000m, 1200m, A$84,200, HK$2,322,315 in Aust. and HK, AJC Canonbury S., L, 2d STC Silver Slipper S., Gr.2, AJC Kindergarten S., L, 3d AJC Brian Crowley S., L.
Vampire (Flying Spur). 6 wins from 1300m to 1800m, A$189,255, AJC Woolworths Liquor H., 2d AJC Fernhill H., Gr.3, TL Baillieu H., L.